I have posted the complete 500 verses rendered by Bombay Sisters also in each satakas (100 verses) separate files whereas The 4 CD volume has the 5 hundreds distributed into 4 volumes. pleased with the post !! THANKS A LOT !!! COULD U POST ON GODDESS BHUVANESHWARI & RAJA RAJESHWARI SLOGAMS OF OLDEN DAYS COMPOSITION & MUSIC !!! You might find it by using search bar, which is availabe on the right top of this site, if not we will be posting coming days. Cud u pls provide Shri Raja Rajeshwari Sahasranama in Sanskrit, I got the Book in Kannada. Wud be helpful If u give it in Sanskrit. Cud u pls provide Sri Raja Rajeshwari Sahnasranamavali in Sanskrit. It wud be helpful. I have got Kannada Version. Got it from Sapana Book House, GandhiNagar, Bangalore. Thank you very much! Cannot express my pleasure founding this post! Regards! May Kamashi devi bless you! Thanks a million! I have been searching for mooka panchasati audio for a very very long time. I just can't express how happy i am seeing this post today. Thanks a lot. May Goddess Kamakshi shower you with her choicest blessings! 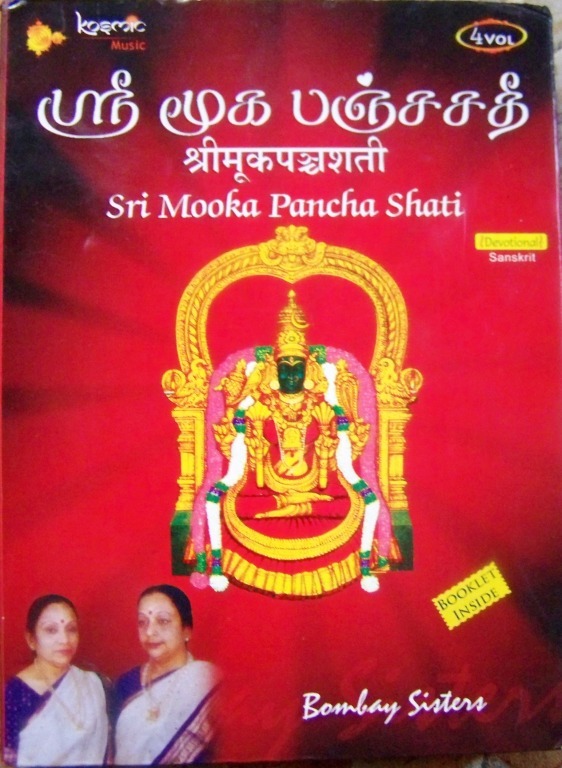 MookaPancaSati is a very powerful divine stotra done by Mooka Sankara with the blessings of Divine Mother Kamakshi Amman. May Mother bless you and your family.